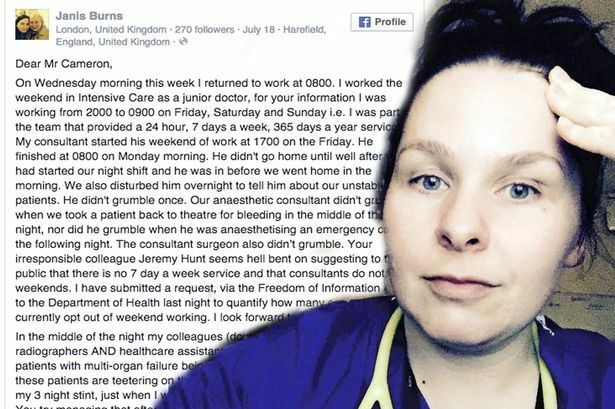 An NHS doctor has attacked the Tories’ ‘dishonest’ reply to an open letter she wrote that was shared 180,000 times. Janis Burns sparked a mass trend when she penned a searing missive to David Cameron over the Tories’ 7-day NHS plans. Fresh from a weekend of graveyard shifts, she complained her colleagues already work all week long and she earns less than a Pret a Manger coffee shop manager. And she sarcastically congratulated the PM on his ‘inflation-busting pay rise’ as NHS staff flooded Twitter with selfies under the hashtag #ImInWorkJeremy. Now the £34,000-a-year junior anaesthetist has received a signed two-page response from health minister Ben Gummer. But she’s not happy – claiming his reply doesn’t answer her questions and misses out key facts.